For other people named Paul Harvey, see Paul Harvey (disambiguation). Paul Harvey Aurandt (September 4, 1918 – February 28, 2009), better known as Paul Harvey, was an American radio broadcaster for the ABC Radio Networks. He broadcast News and Comment on weekday mornings and mid-days and at noon on Saturdays, as well as his famous The Rest of the Story segments. From 1952 through 2008, his programs reached as many as 24 million people a week. Paul Harvey News was carried on 1,200 radio stations, 400 American Forces Network stations, and 300 newspapers. Harvey was born in Tulsa, Oklahoma, the son of a policeman who was killed by robbers in 1921. He made radio receivers as a young boy, and he attended Tulsa Central High School where teacher Isabelle Ronan was "impressed by his voice". On her recommendation, he started working at KVOO in Tulsa in 1933 helping to clean up when he was 14. He eventually was allowed to fill in on the air, reading commercials and the news. He continued working at KVOO while attending the University of Tulsa, first as an announcer and later as a program director. He spent three years as a station manager for KFBI AM, now known as KFDI, a radio station that once had studios in Salina, Kansas. From there, he moved to a newscasting job at KOMA in Oklahoma City, and then to KXOK in St. Louis in 1938 where he was Director of Special Events and a roving reporter. Harvey then moved to Hawaii to cover the United States Navy as it concentrated its fleet in the Pacific. He was returning to the mainland from assignment when the Japanese attacked Pearl Harbor. He eventually enlisted in the United States Army Air Forces but served only from December 1943 to March 1944. His critics[specify] claimed that he was given a psychiatric discharge for deliberately injuring himself in the heel. Harvey angrily denied the accusation, but was vague about details: "I cannot tell you the exact wording on my discharge." Harvey then moved to Chicago, where in June 1944, he began broadcasting from the ABC affiliate WENR. In 1945, he began hosting the postwar employment program Jobs for G.I. Joe on WENR. Harvey added The Rest of the Story as a tagline to in-depth feature stories in 1946. Harvey's "escapade" prompted the U.S. attorney for Illinois to empanel a grand jury to consider an espionage indictment; Harvey "went on the air to suggest he was being set up"; the grand jury subsequently declined to indict Harvey. On April 1, 1951, before the grand jury's decision, the ABC Radio Network debuted Paul Harvey News and Comment "Commentary and analysis of Paul Harvey each weekday at 12 Noon". Harvey was also heard originally on Sundays; the first Sunday program was Harvey's introduction. Later, the Sunday program would move to Saturdays. The program continued until his death. From the late 1960s through the early 1980s, Harvey recorded five-minute video editorials that local television stations could insert into their local news programs or show separately. Some of those editorials were recorded, such as his "Warning To The Nation," broadcast on ABC Radio on April 3, 1965 and "Freedom to Chains," from the same year. In the latter half of his career, Harvey was also known for the radio series The Rest of the Story, described as a blend of mystery and history, which premiered on May 10, 1976. The series quickly grew to six broadcasts a week, and continued until Harvey's death in 2009. The Rest of the Story series was written and produced by the broadcaster's son, Paul Harvey, Jr., from its outset and for its thirty-three year duration. Harvey and his radio network stated that the stories in that series, although entertaining, were completely true. This was contested by some critics, including urban legend expert Jan Harold Brunvand. In November 2000, Harvey signed a 10-year, $100 million contract with ABC Radio Networks. A few months later, after damaging his vocal cords, he went off the air, but returned in August 2001. Former Senator Fred Thompson substituted for Harvey regularly from 2006 to 2007. Other substitutes for Harvey included his son, Paul Harvey, Jr., Doug Limerick, Paul W. Smith, Gil Gross, Ron Chapman, Mitt Romney, Mike Huckabee, Mort Crim, Art Van Horn, Scott Shannon, and Tony Snow. Three weeks after Harvey's death, the entire News and Comment franchise was canceled. Harvey did not host the show full-time after April 2008, when he came down with pneumonia. Shortly after his recovery, his wife died on May 3, causing him to prolong his time away from broadcasting. He voiced commercials, new episodes of The Rest of the Story and News & Comment during middays a few times a week, with his son handling mornings. Harvey's on-air persona was influenced by that of sportscaster Bill Stern. During the 1940s, Stern's The Colgate Sports Reel and newsreel programs used many of the techniques later used by Harvey, including his emphatic style of delivery, and the use of phrases such as Reel Two and Reel Three to denote segments of the broadcast—much like Harvey's Page Two and Page Three. Harvey was also known for catch phrases he used at the beginning of his programs, such as "Hello Americans, this is Paul Harvey. Stand by for NEWS!" He always ended, "Paul Harvey ... Good day." or "Paul Harvey ... Good night." A story might be "This day's news of most lasting significance." At the end of a report about someone who had done something ridiculous or offensive, Harvey would say, "He would want us to mention his name," followed by silence, then would start the next item. The last item of a broadcast, which was often a funny story, would usually be preceded by "And now from the 'what-it's-worth' department . . ."
Other phrases made famous by Harvey included "Here's a strange..." (a story with an unusual twist) and "Self-government won't work without self-discipline." In addition to the inquiry into whether Harvey's Rest of the Story tales are true, Harvey's trademark ability to seamlessly migrate from content to commercial brought scrutiny. In that context, Salon magazine called him the "finest huckster ever to roam the airwaves." Some have argued that Harvey's fawning and lavish product endorsements may be misleading or confusing to his audience. Harvey's endorsed products included EdenPure heaters, Bose radios, Select Comfort mattresses, and Hi-Health dietary supplements, including a supplement that was claimed to improve vision but was later the subject of a Federal Trade Commission enforcement action against the manufacturer (but not Harvey himself) for misleading claims made on Harvey's show. In one of the tribute broadcasts, Gil Gross said Harvey considered advertising just another type of news, and he only endorsed products he believed in, often interviewing someone from the company. Harvey was an avid pilot. He briefly served in the US Army Air Corps from December,1943 to March, 1944. Harvey had been an Aircraft Owners and Pilots Association (AOPA) member for more than 50 years, and would occasionally talk about flying to his radio audience. He was a member of the Experimental Aircraft Association (EAA), and was frequently seen at EAA AirVenture in Oshkosh, Wisconsin. He was responsible for funding the Paul Harvey Audio-Video Center at EAA headquarters in Oshkosh. Harvey was also an early investor in the Duluth, Minnesota-based aircraft manufacturing company, Cirrus Aircraft. According to AOPA Pilot contributing editor Barry Schiff, Harvey coined the term skyjack, and is credited with popularizing the terms Reaganomics and guesstimate. Beginning in 1952, Harvey was a friend of FBI Director J. Edgar Hoover. Harvey would often submit "advance copies of his radio script for comment and approval." It is believed that Harvey's friendship with Hoover helped Harvey escape criminal charges relating to his trespassing at Argonne National Laboratory. Nevertheless, Paul Harvey was happy to defend his friend, and spoke of him on his show of April 25, 1963, saying: "God help the United States without John Edgar Hoover. ... (FBI) Director Hoover is not retiring. If you have heard otherwise, somebody's sinister wish was the father of that thought. It is not so." Harvey was also a close friend of Senator Joseph McCarthy and supporter of his search for Communists. Harvey was also a close friend of George Vandeman and the Reverend Billy Graham. From the mid-1970s until the mid-1980s, Harvey attended Calvary Memorial Church in Oak Park. When the church moved from its original location on Madison Street to the former Presbyterian Church on Lake Street, Harvey asked his friend Graham to preach at the dedication service. Harvey associated with various congregations of different denominations. He and his wife regularly attended the Camelback Adventist Church in Scottsdale, Arizona during his winters there. He often quoted Adventist pioneer Ellen G. White in his broadcasts and received the "Golden Microphone" Award for his professionalism and graciousness in dealing with the church. He was also active with a small Plymouth Brethren meeting in Maywood, Illinois called Woodside Bible Chapel. [He] personalized the radio news with his right-wing opinions, but laced them with his own trademarks: a hypnotic timbre, extended pauses for effect, heart-warming tales of average Americans and folksy observations that evoked the heartland, family values and the old-fashioned plain talk one heard around the dinner table on Sunday. Harvey was elected to the National Association of Broadcasters National Radio Hall of Fame and Oklahoma Hall of Fame, and appeared on the Gallup poll list of America's most admired men. In addition he received 11 Freedom Foundation Awards as well as the Horatio Alger Award. Harvey was named to the DeMolay Hall of Fame, a Masonic youth organization, on June 25, 1993. On May 18, 2007, he received an honorary degree from Washington University in St. Louis. 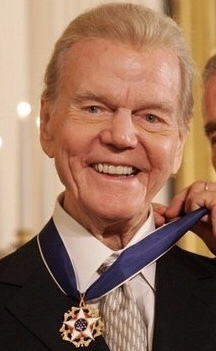 Paul Harvey was inducted as a Laureate of The Lincoln Academy of Illinois and awarded the Order of Lincoln (the State's highest honor) by the Governor of Illinois in 1987 in the area of Communication. Harvey was born and raised in Tulsa, Oklahoma, the son of Harry Harrison Aurandt (1873–1921) and Anna Dagmar (née Christensen) Aurandt (1883–1960). His father was born in Martinsburg, Pennsylvania; his mother was a native of Denmark. He had one sibling, an older sister Frances Harrietta (née Aurandt) Price (1908–1988). In 1940, Harvey married Lynne Cooper of St. Louis. She was inducted into Phi Beta Kappa at Washington University in St. Louis and a former schoolteacher. They met when Harvey was working at KXOK and Cooper came to the station for a school news program. Harvey invited her to dinner, proposed to her after a few minutes of conversation and from then on called her "Angel," even on his radio show. A year later she said yes. The couple moved to Chicago in 1944. On May 17, 2007, Harvey told his radio audience that Angel had developed leukemia. Her death, at the age of 92, was announced by ABC radio on May 3, 2008. When she died at their River Forest home, the Chicago Sun-Times described her as, "More than his astute business partner and producer, she also was a pioneer for women in radio and an influential figure in her own right for decades." According to the founder of the Museum of Broadcast Communications, Bruce DuMont, "She was to Paul Harvey what Colonel Parker was to Elvis Presley. She really put him on track to have the phenomenal career that his career has been." Lynne Harvey was the first producer ever inducted into the Radio Hall of Fame, and had developed some of her husband's best-known features, such as "The Rest of the Story." While working on her husband's radio show, she established 10 p.m. as the hour in which news is broadcast. She was the first woman to receive a lifetime achievement award from the Chicago chapter of American Women in Radio and Television. She worked in television also, and created a television show called Dilemma which is acknowledged as the prototype of the modern talk show genre. While working at CBS, she was among the first women to produce an entire newscast. In later years, she was best known as a philanthropist. They had one son, Paul Aurandt, Jr., who goes by the name Paul Harvey, Jr. He assisted his father at News and Comment and The Rest of the Story. Paul, Jr., whose voice announced the bumpers into and out of each News and Comment episode, filled in for his father during broadcasts and broadcast the morning editions after the passing of his mother. Harvey died on February 28, 2009, at the age of 90 at a hospital in Phoenix, Arizona, surrounded by family and friends. No cause of death was announced. In response to his father's death, his son, Paul Harvey Jr., said, "millions have lost a friend". At the time of his death, he had less than two years left on his ten-year contract. Former President George W. Bush issued a statement on Harvey's death, calling Harvey: "a friendly and familiar voice in the lives of millions of Americans." On March 4, Gil Gross was chosen to become the next host of News & Comment. New owners Citadel Broadcasting, which had bought ABC News Radio from Disney in 2008, chose Mike Huckabee, instead, but the show lasted only one week before being taken off the air. Gross was actually happy not to have to do the show as that would have had him going into KGO San Francisco at around 1:00 a.m. to prep for the show that morning for the East Coast broadcasts (and his talk show was not until the late afternoon). Harvey's full-length biography, Good Day! The Paul Harvey Story, was published in May 2009 by Regnery Publishing. On February 3, 2013, a recording of Harvey's "So God Made a Farmer" commentary was used by Ram Trucks in a commercial titled "Farmer," which aired during Super Bowl XLVII. Autumn of Liberty. Garden City, New York: Hanover House, 1954. The Rest of the Story. Garden City, New York: Hanover House, 1956. Our Lives, Our Fortunes, Our Sacred Honor. Waco, Texas: Word Books, 1975. Paul Harvey's For What It's Worth. New York: Bantam Books, 1991, ISBN 0-553-07720-1. Remember These Things. Chicago: The Heritage Foundation, 1952. ^ Harvey guided his black Cadillac Fleetwood toward Argonne, arriving sometime past midnight. He parked in a secluded spot, tossed his overcoat onto the barbed wire topping a fence, then scampered over.... Harvey['s plan was] to scratch his signature on 'objects that could not possibly have been brought to the site by someone else,' according to a statement later given by an off-duty guard who accompanied him.... But seconds after Harvey hit the ground, security officers spotted him.... Harvey ran until, caught in a Jeep's headlights, he tripped and fell. As guards approached, Harvey sprang to his feet and waved. Guards asked whether Harvey realized he was in a restricted area. Harvey replied no, that he thought he might be at the airport because of the red lights.... Harvey told the authorities he had been headed to a neighboring town to give a speech when his car died.... Under questioning, Harvey eventually dropped his cover story but refused to elaborate, saying he wanted to tell his tale before a congressional committee. Guards searched his Cadillac and found ... a four-page, typewritten script for an upcoming broadcast. Harvey, it turned out, had planned from the outset to feed the nation a bogus account of his escapade: "I hereby affirm the following is a true and accurate account," the script began. "My friend and I were driving a once-familiar road, when the car stalled.... We started to walk.... We made no effort to conceal our presence.... Suddenly I realized where I was. That I had entered, unchallenged, one of the United States' vital atomic research installations.... Quite by accident, understand, I had found myself inside the 'hot' area.... We could have carried a bomb in, or classified documents out. ^ McFadden, Robert D. (March 2, 2009). "Paul Harvey, Homespun Radio Voice of Middle America, Is Dead at 90". The New York Times. Retrieved September 3, 2018. ^ "Paul Harvey". Encyclopaedia Britannica. Retrieved September 3, 2018. ^ a b Michael Carlson, "Paul Harvey: Influential conservative American radio host", The Guardian, March 3, 2009. ^ a b c d e f g Joe Stephens (January 23, 2010). "New documents show longtime friendship between J. Edgar Hoover and Paul Harvey". The Washington Post. Retrieved January 23, 2010. ^ "Officer Harry H. Aurandt". ^ Joe Howard (November 2, 2006). "Paul Harvey: A Legend Looks Back". Radio Ink. Archived from the original on September 28, 2011. ^ Marc Fisher (October 1998). "A Lifetime on the Radio". American Journalism Review. ^ Pittenger, Todd. "Paul Harvey's employment at 19/KFBI". Metro Source News. Retrieved February 14, 2012. ^ "KXOK in St. Louis to Debut September 19," Broadcasting, September 15, 1938, p. 26. ^ a b Linda Witt (January 22, 1979). "Forget Cronkite: Paul Harvey Is the Biggest Newscaster in America, and Getting Bigger". Vol. 11 No. 3. People. ^ "Paul Harvey's Attempted Hoax Was Beginning of Beautiful Friendship". January 23, 2010. ^ Bill J. Akers (June 22, 2013). "PAUL HARVEY FREEDOM TO CHAINS 1965 (BEST VERSION)" – via YouTube. ^ Interview with Paul Harvey Archived July 8, 2011, at the Wayback Machine, CNN Larry King Live, January 30, 2003 (accessed May 6, 2010). ^ Dan Wilson (September – October 1997). "The Right of the Story". Fairness and Accuracy in Reporting. ^ "Paul Harvey's Tribute to Slavery, Nukes, Genocide". July 1, 2005. ^ "The Rest of Paul Harvey's Story". March 1, 2009. ^ Michael Carlson, "Obituary: Paul Harvey", The Guardian, March 3, 2009. ^ CNSnews.com Archived August 24, 2004, at the Wayback Machine, Retrieved on 2008/04/09. ^ WJR.net, Retrieved on 2008/04/09. ^ Kgoam810.com Archived November 1, 2011, at the Wayback Machine, Retrieved on 2008/04/09. ^ Businessweek.com, Retrieved on 2008/04/02. ^ Romney To Fill In For Paul Harvey Archived January 18, 2009, at the Wayback Machine. Radio Ink. April 9, 2008. ^ John Dunning, The Encyclopedia of Old-Time Radio (Oxford University Press US, 1998), ISBN 978-0-19-507678-3, p. 163. Excerpt available at Google Books. ^ Houston Radio REWIND (December 16, 2013). "KODA 99 FM Radio Houston (1964)" – via YouTube. ^ "Paul Harvey Landon Lecture". www.k-state.edu. ^ Craig Harris, "FTC fines Hi-Health $450,000 over Paul Harvey ads", Arizona Republic, August 24, 2005. ^ "NNDB Paul Harvey". Retrieved September 26, 2015. ^ Rupert Cornwell (March 5, 2009). "Paul Harvey: Radio Broadcaster Who Became the Voice of America (obituary)". London: The Independent. ^ The Editors of AVweb (August 2, 1999). "Oshkosh 1999 Newswire: Day Six - Cirrus Gets Stockholders To Show Them The Money". Oshkosh, Wisconsin: AVweb. ^ III, Ira David Wood. Wilds, Bernard (ed.). "JFK Assassination Chronology" – via Amazon. ^ Corliss, Richard (March 5, 2009). "Paul Harvey". Time. Retrieved May 22, 2010. ^ a b c Batura, Paul (May 19, 2009). Good Day! The Paul Harvey Story. Regnery Publishing. pp. 178–185. ISBN 978-1-59698-101-0. ^ Oliver, Ansel (March 5, 2009). "American reado legend Harvey's death ends unique era of radio news". Adventist News Network-Seventh-day Adventist Church. Retrieved August 9, 2016. ^ The Religious Affiliation of Radio Broadcaster Paul Harvey at Adherents.com. ^ SDALink Paul Harvey Tribute Archived July 21, 2012, at Archive.today. ^ "Citations for Recipients of the 2005 Presidential Medal of Freedom". georgewbush-whitehouse.archives.gov. ^ "Laureate Convocations by Year - The Lincoln Academy of Illinois". ^ Owens, Ron (2000). Oklahoma Heroes: The Oklahoma Peace Officers Memorial. Turner Publishing Company. pp. 41–42. ISBN 1-56311-571-9. Retrieved May 6, 2008. ^ a b c "Paul Harvey's Wife Dies at Age 92". ABC News. May 3, 2008. Retrieved August 6, 2010. ^ Wendy, Katie (June 14, 2009). "Good Day! The Paul Harvey Story". Washington Times. Retrieved August 6, 2010. ^ a b "Lynne 'Angel' Harvey Dies At 92". Radio Ink. May 5, 2008. Archived from the original on February 27, 2012. Retrieved August 6, 2010. ^ "Wife of broadcaster Paul Harvey dies". Daily Herald. May 4, 2008. Retrieved August 6, 2010. ^ "Death Notice: Lynne Harvey". Chicago Tribune. May 4, 2008. Retrieved August 6, 2010. ^ "Paul Harvey Obituary". New York Times. March 6, 2009. Retrieved September 24, 2014. ^ "Statement from ABC Radio Networks on the passing of Paul Harvey". February 28, 2009. Archived from the original on March 4, 2009. Retrieved March 1, 2009. ^ "Statement by Former President George W. Bush on the Death of Paul Harvey". February 28, 2009. Retrieved March 1, 2009. ^ Hinckley, David (March 22, 2009). "On the radio: How ABC will replace 'Rest' of Paul Harvey spots". New York Daily News. Retrieved March 3, 2011. Dan Wilson (September – October 1997). "The Right of the Story". Fairness and Accuracy in Reporting. Is Paul Harvey's reporting accurate? McFadden, Robert D. "Paul Harvey, Homespun Radio Voice of Middle America, Is Dead at 90," The New York Times, Monday, March 2, 2009.